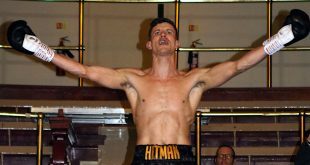 The undercard of Fight Academy's David Haye - Alexander Gurov European Cruiserweight title bout in Bracknell last night was full of cracking contests, headed by a heavyweight bout between Maidenhead's Roman Greenberg and Texas tourist Kendrick Releford. Greenberg, originally from Russia by way of Israel, came into the contest undefeated in twenty bouts while Releford had shared the ring with such accomplished opposition as DaVarryl Williamson, Alexander Dimitrenko, Eliecer Castillo and Robert Hawkins. The first frame was very slow as Greenberg and Releford started by feeling each other out, throwing very few punches. Only a few good jabs were landed by Greenberg. The second is highlighted by a good left hook from Greenberg followed up by a nice combination. Releford answers with a stiff one - two then backs Greenberg up with a good spell in the corner, unloading some nice body shots. Releford begins the third with some good jabs followed by a great right hook. Greenberg misses a huge body shot as the round fizzles out slowly. The fourth is another slow round with little action until Greenberg opens up with a good jab followed by a thumping right that rocks the big Texan back across the ring. Greenberg senses he’s stunned his adversary and follows up with two solid right crosses - a good fourth frame for Greenberg. Releford's corner had strong words with their man during the break and he comes out swinging, landing a good body shot followed by a cracking left to the ribs of Greenberg. 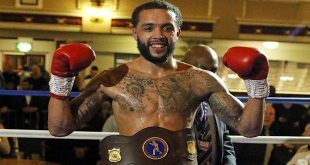 The undefeated prospect responds with two hard right hooks followed by two more that seem to daze Releford again. The contest is turning into a tough brawl now and the crowd loves it. During the sixth, Greenberg appears marked under his left eye but on closer inspection it seems to be just a deep graze. There's lots of feigning from both fighters until Greenberg lands some more heavy one - two combinations that are answered swiftly by Releford, who stings Greenberg with his own one - two. Releford's accuracy is abysmal in the seventh as he throws punches from too far away. The seventh closes with Greenberg landing with more hard combinations that are again answered swiftly by Releford. Greenberg's marked up face seems to be worsening as the eighth pans out into an obvious breather for both men with very little action taking place. Both fighters appear tired in the ninth until Greenberg launches an assault of one - two combinations followed by some thumping body shots. Again, the round pans out quietly with little action. The final round sees Releford finally come forward and lands some decent blows that send Greenberg backwards onto the ropes. Greenberg gathers himself and comes back with some solid body shots followed by a great right cross, closing a good round. After the final bell Greenberg has his hand raised by the referee, winning his twenty first bout 98-93. 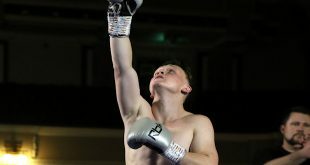 In other action, Watford light heavy Gary Ojuederie continues his winning ways by gaining a convincing points win over Reading's Sammy Price while Colnbrook's Jamie Hearn draws with Stirling's Ryan Kerr for the English Super Middleweight title after a disgraceful judge's decision after ten rounds. The crowd's language towards the officials was colourful to say the least. Hearn won this fight for me pretty convincingly. 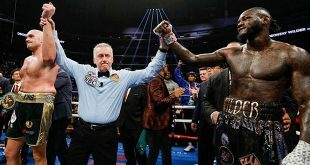 Bradford's Femi Fehintola outpointed tough Frenchman Frederic Gosse over eight rounds at lightweight and former junior heavyweight amateur champ Vadym Usenko on his pro debut at cruiserweight destroyed Bristol's Csaba Andras in one round with a ferocious punch that left Andras nailed to the canvas. Usenko can bang and stalked Andras for the first minute with his right hand cocked and ready for the opening. He only threw it once and Andras will be thanking God that was all. A heavy, heavy knockout. A big thank you to Lee Steele, Dave Lewis from Fight Academy, Carlton and David Haye and lastly Clinton Woods. A great night of boxing! Simon Shaw can be contacted at djsishaw69@yahoo.co.uk.